Nanomaterials Market was valued at $14,741.6 million in 2015, and is expected to reach $55,016 million by 2022, supported by a CAGR of 20.7%. Nanomaterials can be defined as the materials with at least one external dimension in the size range of approximately 1 to 100 nanometers. 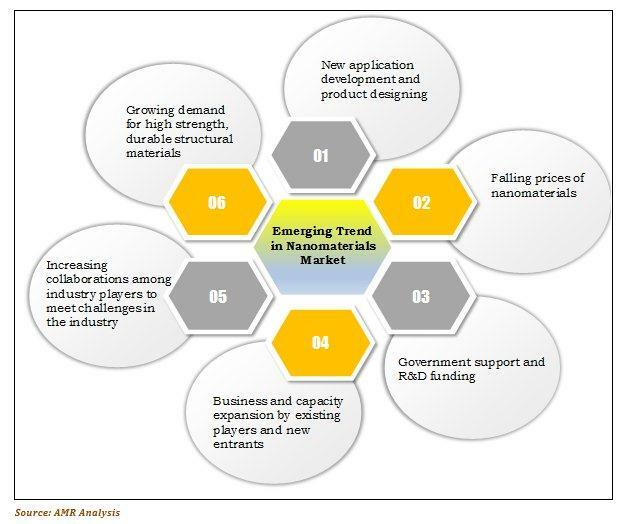 The report focuses on current market trends and future growth opportunities of nanomaterials, in industries such as paints & coatings, adhesives & sealants, healthcare, energy, electronics & consumer goods, personal care, and others. It also emphasizes on various types of nanomaterials that are commercially available in the market, namely, carbon based (carbon nanotubes, fullerenes & POSS, and graphene), metal and non-metal oxides (titanium dioxide, zinc oxide, silicon dioxide, aluminum oxide, cerium oxide, antimony tin oxide, copper oxide, bismuth oxide, cobalt oxide, iron oxide, magnesium oxide, manganese oxide, and zirconium oxide), metals (silver, gold, nickel, and quantum dots), dendrimers, nanoclay, and nanocellulose. It also analyzes the current market trends of nanomaterials in different geographies and suggests the future growth opportunities by analyzing government regulations & policies, which can further increase the consumer acceptance in that region. According to the perspective of leading companies, the factors that drive the demand for nanomaterials in various end-user industries are growing investment in research and development, increasing popularity of nanomaterials in various application industries, and the excellent physio-chemical properties of nanomaterials. Nanomaterials are usually added in small quantities to improve the performance of the base material. However, factors such as stringent environmental regulations and high price of nanomaterials may hamper the market growth. Currently, the paints & coatings, adhesives & sealants, electronics & consumer goods, and personal care segments are the major end-user markets for nanomaterials. Key players in the world nanomaterial market have adopted different business strategies such as capacity and business expansion, partnerships, mergers, acquisitions, and product & application development to survive in the global competitive market. The market players profiled in this report are nanomaterials manufacturers who either use it internally in some applications, or supply it to other end-users in the industry. The data pertaining to market players and their strategic moves are gathered through press releases of the respective companies, various blogs available on their websites, and primary calls made to the experts in the industry. Asia-Pacific is the most attractive market for the new entrants along with industry players on account of the increasing demand for nanomaterials. The growing number of industries and increased expenditure towards nanotechnology research is expected to provide significant opportunities to the industry players. The carbon based nanomaterials segment includes fullerenes, graphene, and carbon nanotubes. It has become important due to its unique combinations of chemical & physical properties, which involve thermal conductivity, electrical conductivity, high mechanical strength, and optical properties. The unique physio-chemical properties of these materials has led to their utilization in various industrial applications, such as high-strength materials and electronics. Metal & non-metal oxides have a major role in many areas of chemistry, physics, and materials science. They are useful in various technological applications such as fabrication of microelectronic circuits, sensors, piezoelectric devices, fuel cells, coatings for the passivation of surfaces against corrosion, and as catalysts. Dendrimers are tree-like molecules with well-defined cavities. They are defined by three components, namely, a central core, an interior dendritic structure (the branches), and an exterior surface with functional groups. Different combinations of these components generate differently shaped and sized products, with shielded interior cores that are meant for applications in both biological and materials sciences. In the aerospace industry, aircraft manufacturers are striving towards making aerospace parts stronger, tougher, and long-lasting. Recent research has revealed that nano-enabled products in aircrafts can increase fatigue life by 200 to 300%. Components fabricated with carbon nanotubes reinforced polymers can deliver improved mechanical, electrical, and thermal properties. Similarly, polymer-silicate nanocomposites can be used in fuel storage tanks. Increased commercial application of nanomaterials in the aerospace industry will provide significant opportunity to the material suppliers and part fabricators. Nanomaterials are meant for developing novel characteristics and have the potential to improve quality of life. However, these materials may also pose risks to the environment and raise health & safety concerns. Regulatory agencies are the governmental bodies that implement and enforce specific independent laws over some area of human activities. Thus, regulations of nanomaterials are mainly focused on their impact on human health and the environment. Regulatory bodies also check the hazardous wastes generated due to processing or manufacturing of nanomaterials. There are several regulatory bodies related to nanomaterials such as EPA, TSCA, RCRA, NIOSH, CLP/GHS, REACH, and others. 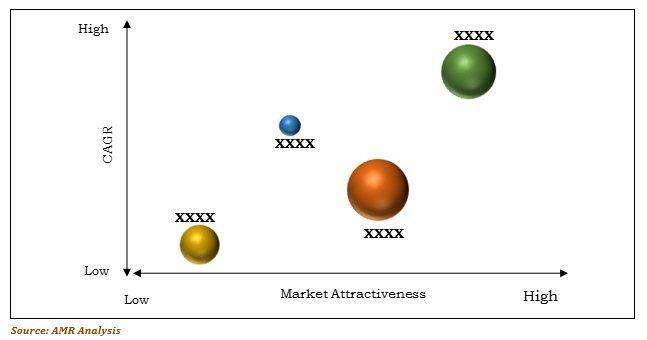 Comprehensive competitive analysis and profiles of major market players such as Ahlstrom, Air Products and Chemicals Inc., Arkema Group, CNano Technologies Ltd., Daiken Chemicals, DuPont, Fuso Chemical Co., Ltd., MKnano, Nanoco, Nanocyl S.A., NanoIntegris, Nanophase Technologies Inc., Nanosys Inc., Southern Clay Products, Inc., TDA Research, and Umicore NanoMaterials are provided in this report. Comprehensive analysis of factors that drive and restrict the growth of the global nanomaterials market is provided in the report. The projections in the report are based on the analysis of the current market trends and future market potential for the period of 2014&dash;2022 in terms of value and volume. The segmentation of the nanomaterials market based on region is provided to understand the ongoing trends across various geographies. Exhaustive analysis of the world nanomaterial market by end user helps in understanding the penetration level of nanomaterials in various applications across different regions and countries. In-depth analyses of current research and developments in the nanomaterials is provided along with key market dynamic factors to understand the market dynamics. Extensive analysis of the market is conducted by following key product positioning and monitoring the top contenders in the market. Key players in the nanomaterials industry have been profiled in the report and their strategies have been analyzed thoroughly to understand the competitive outlook of the market. 7.2 Air Products and Chemicals, Inc.
7.7 FUSO CHEMICAL CO., LTD.